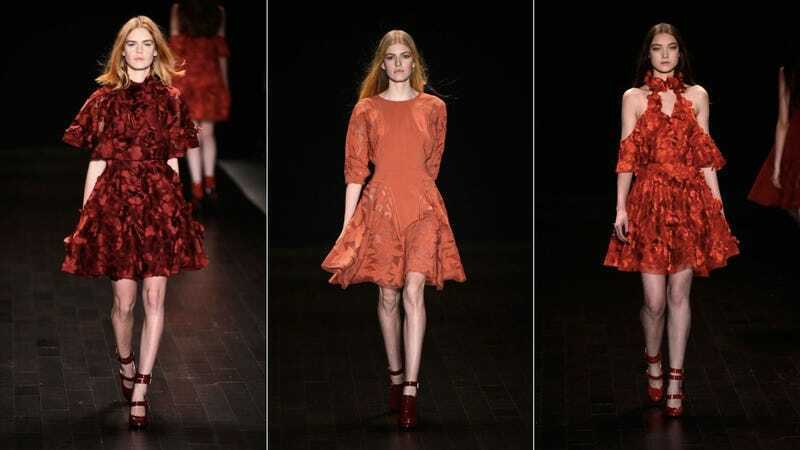 Stuart told the press that this season's collection at Mercedes-Benz Fashion Week was modeled after the British model Stella Tennant and her friends ("I was thinking about the beautiful dinners and the charades she and her friends play, and the great performances they see at the end of the night"). But these looks remind me of coquettish torch singer Jessica Rabbit, devoted wife of Roger. In shades of red, blush and black, with intricate detailing and stand-alone collars at the neckline, it'd be perfect for Mrs. Rabbit if she got out of the seedy partially-animated nightclub scene and spun remixes at an Oscar afterparty.